Brace yourself for what you are about to see. 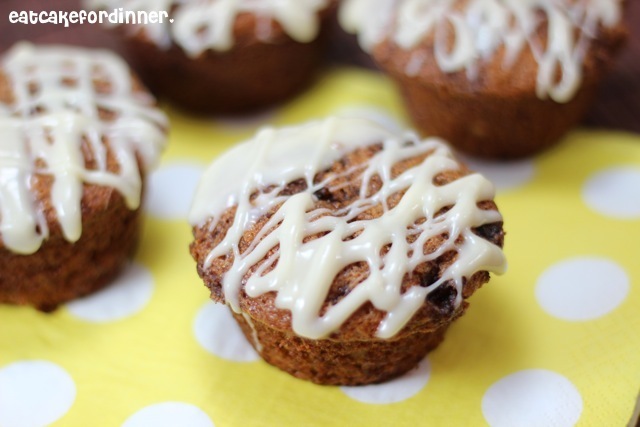 This could quite possibly be the best thing that ever happened to a banana muffin. Not only is it an amazing idea by adding a cinnamon and sugar swirl, but adding Cream Cheese Icing too. Oh man, divine. The combination of all-purpose flour and cornstarch will produce a similar product as when using cake flour. Cornstarch is also used in these Best Ever Chocolate Chip Cookies and these Chewy Red Velvet Cookies and I believe that is what helps them be chewy (it's their secret ingredient). Who knew you could use cornstarch for more than just a thickening agent. 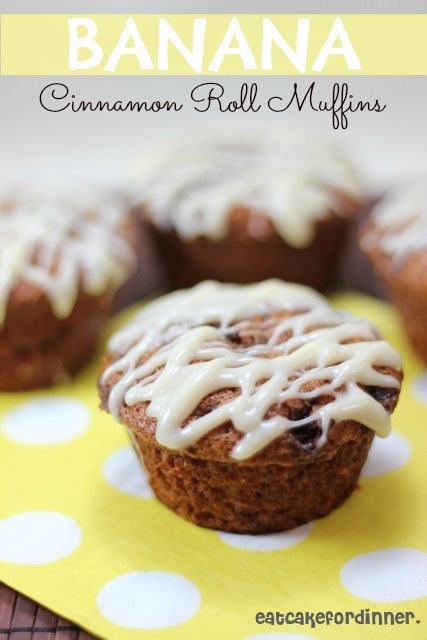 These muffins are delicious and they are not overly sweet. They taste great for several days and are the perfect mid-day snack at work! Preheat oven to 350 degrees. Grease and/or line muffin tin; set aside. Whisk together eggs, oil, sugar and banana until well blended. In a separate bowl, combine the flour, cornstarch, cinnamon, nutmeg, baking powder, baking soda and salt. Add dry ingredients to the wet ingredients and mix until just combined. Divide batter evenly between 12 muffin cups, filling about 2/3 full. Combine all topping ingredients and divide between the muffin cups. Use a toothpick and swirl slightly. Bake for 22-24 minutes or until the top springs back when lightly touched. Allow to cool for a few minutes and carefully remove from pan. Cool completely and drizzle with cream cheese icing. Yield: 12 muffins. Refrigerate any leftover muffins. For the icing: Microwave the cream cheese for 10-15 seconds or until very soft. Add the powdered sugar and vanilla and stir together until smooth and creamy. 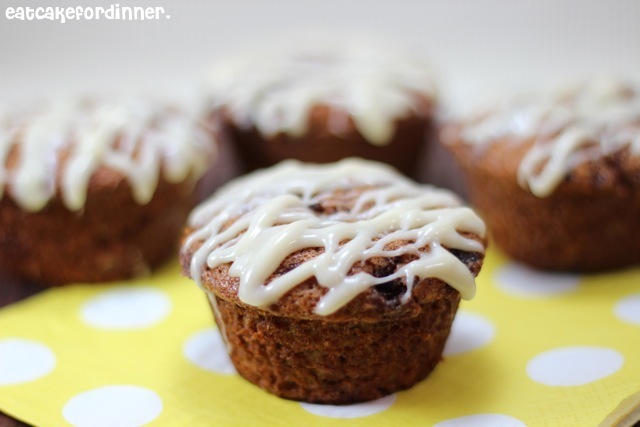 Add enough milk, as needed, to reach desired consistency to drizzle over muffins. Jenn's Notes: I prefer to bring my muffins to room temperature before eating. They do not become dry after being refrigerated. Delicious. Yum, I want these for my Sunday breakfast! My two favorites...Banana bread and cinnamon rolls!!! These look delish! I know what I'm going to do with the almost the perfect ripeness for these muffins bananas that are sitting on my counter :-) Thanks for the recipe! yum!!! I use this icing recipe too..and just realized a little milk will do the trick. Oh Jenn, these look so good! These sound amazing! Thanks so much for sharing, Jenn! They've been pinned. Have a great day! Thanks so much for linking up over at Finding the Pretty & Delicious Linky Party. Hope you'll join in again on Saturday.